Do You Want To Keep Trusting God Too? Always keep trusting God no matter what you are going through! Here are some encouraging scriptures about the topic of how to keep trusting God. Psalm 56:4 In God, whose word I praise— in God, I trust and am not afraid. What can mere mortals do to me? Trusting In God Is The Way To Strive! 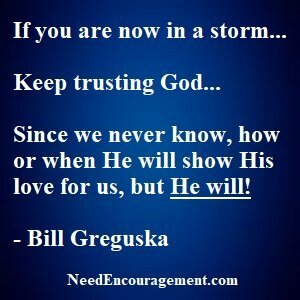 Keep Trusting God No Matter The Storm! Keep trusting God, even when things look bad. You have made it these many years, and God is not going to leave you. He is with you when you call on Him! You hear stories in the media about how people make total changes in their life it can make you wonder sometimes. If I did not experience it for myself, it would be hard to believe that God could change my life the way he did. I learned from my drug and alcohol problems, but even so, the process of change took God’s time to accomplish, for on my own, I was powerless. The world, the flesh, and the devil have attacked me in other areas such as anger, trying to control things that were not mine to manage, and disregarding what I knew deep inside my heart not to do. I thank God that my testimony turned out for good over time. God is still not done working in my life, as He is still not done in your life either. I do not only believe in God, which a lot of people say that they do, but I have a relationship and a love for God from experiencing His love and grace, protection and guidance, His patience and encouragement so many times in my life. God has saved me from my former direction in life here on earth and assured me that he had protected me just by offering his eternal salvation. This I have accepted by faith (merely believing what He has said, knowing that a living Person is standing behind His word, able and willing to see me all the way through as a Shepherd leads his sheep). Don’t Give Up Hope, Keep Trusting God! Encouraging Scriptures Having To Do With Trusting God! John 3:3 In reply Jesus declared, I tell you the truth, no one can see the kingdom of God unless he is born again. Psalm 121:1-2 I lift up my eyes to the hills—where does my help come from? My help comes from the LORD, the Maker of heaven and earth. When you have a problem, where should you turn first for help?